This Little Paradise is the best kept secret in Pacific Grove.- Last review, before remodel was completed, calls it: 'As close to perfection allowed'. Ideal resort for honeymooners or couples who are looking for an anniversary getaway. Last remodel includes an upgraded Studio with King Bed, Gas insert fireplace built-in newly designed stone veneer wall and remodeled Bathroom with Heat Lamp. Most desirable location on the Monterey Bay. - Ocean view from a large private Patio. - One Home away from the Water and two blocks from the Beach at Lovers Point.- Less then one block from P.G. Muni Golf Course and 8 minutes to Pebble Beach Links. Experience an unforgettable stroll along the Monterey Bay to the Aquarium. Upgraded with Gas Insert Fireplace, Oakwood floor and Skylights in Open-Beam Ceiling. Spectacular Ocean View Garden with Fountain, Waterfall and Large Private Patio plus Barbeque Area makes this retreat a Mini-Resort. Kayakers!... We have plenty of storage space in our 3-car garage for your kayaks. Adriana and I were born and raised in Holland and spent most of our life in Silicon Valley. After Adriana bought a high end Boutique Shop in Pebble Beach in 1998, we decided to move to the Monterey Peninsula. One year later, we found this beautiful (5600 Square feet) home with an attached cottage in Pacific Grove. This house plus Cottage is situated on 4 parcels and is one of the largest private residential properties in P.G. 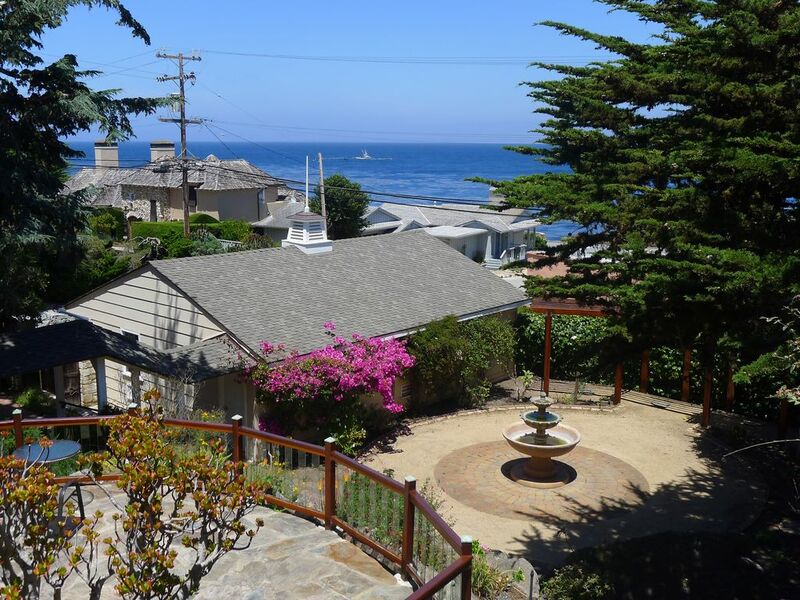 It offers a large Ocean View patio, beautiful garden and more privacy than any other vacation rental in Pacific Grove. Privacy, Romantic, Ocean View, Cosy Surroundings. Close to the Bay, Whale Watching, Golf, Beach, Hiking, Biking and Kayaking. Gas Fireplace in Studio. Electric Heater plus Heat lamps in bathroom. 1 car slot in a 3-car garage is offered at additional cost. After Feb 1, 2013, Kitchen cabinets will refaced with new doors and drawers on slide. Large private ocean view Patio. Gas Barbeque provided. We went to Monterey to celebrate a milestone birthday. The cottage was lovely and the views spectacular. It is very close to the walking trail on Ocean Blvd. The host's garden is a work of art. They even provided 2 passes to the aquarium. Only reason I didnt give it 5 stars was that the floor in the bathroom needed cleaning and the sink wouldn't drain properly. We would stay there again. Cottage was very cute and comfortable. Views of garden and ocean. In fact, ocean promenade was about 1 block away. Easy access to downtown, lighthouse, butterfly sanctuary and, of course, the ocean. If you golf, that's also nearby. Quiet neighborhood. I enjoyed my Christmas holiday visit. Stayed here for a weekend of golf, couldn’t ask for more. Dutches by the Sea is a great place to spend time in the Monterey Peninsula. Wonderful owners and great views from the property. But the studio is in need of a few upgrades. The tile grout in the kitchen is dirty and needs to be replaced, as well as the microwave and frig. But the greatest annoyance is the fireplace with the Nest thermostat and 1 hour timer. The studio is not insulated so it cools off quickly and with the 1 hour timer you must get up at all hours to turn the only source of heat back on at night. With a few improvements the place would be great. First Negative review in many years! It was cold and breezy that week. - Guests arrived 2 days before Thanksgiving. Our cleaning lady was off during this Holiday week. - Therefore, owners were stuck cleaning the cottage. The kitchen counter is an Art Deco counter from the forties. In the more than 10 year history of Dutches-By-The-Sea, we never had a negative review about the kitchen. Just installed a new electric wall heater to supplement the fireplace. Many guests leave the thermostat above 70 degrees when they leave the cottage for up to 6-8 hours every day. - Just ordered 4-6 hour timer switch online. Would have appreciated, if guests would have told us, before departure, about their "greatest annoyance about the fireplace"
Will install a new longer term timer switch within the the next few weeks. Lovely garden and adorable accommodations! Adriana and Jonathan could not have been more helpful. Let's all hope that the city's new rules on rentals do not deprive us of this MARVELOUS spot. Peacful getaway with amazing views! The cottage and location where perfect. Nestled in between Monterey Bay, Pepple Beach and Carmel. Just a block to the ocean and beautiful trails. Most fitting for couples or small family. Garage parking available in a 3-car Garage.